In June 1862, as Federal troops attempted to retreat after withdrawing from Gaine's Mill, Virginia, General Robert E Lee saw an opportunity to annihilate them on the congested roads between White Oak Swamp and the small community of Glendale. Lee's army included most of the notable Confederate luminaries, such as "Stonewall" Jackson, "Old Pete" Longstreet, AP Hill and others, collectively fielding 45,000 men. The Federals, numbering about 40,000, had become disjointed as they attempted to reach and cross the James River. At the same time, though, the Confederate approach became uncoordinated and irregular. The mass of the battle eventually pivoted north of Nelson's Farm, known to the locals by its former owner's name, Frayser. 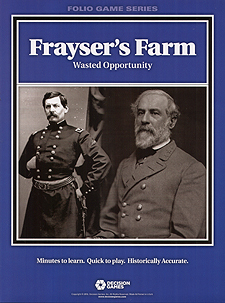 Frayser's Farm utilizes an all-new Musket & Sabre Combat System, which provides a simple yet accurate portrayal of warfare during the American Civil War. The combat system is intuitive, including all the details that characterized battle during the Civil War, while also simulating the unique aspects of 19th century warfare. Units can become weakened and rout, attackers can pursue, and the fortunes of war can intervene at any time. Cavalry can rip open enemy lines and shred fleeing units, and reserves must be ready to plug holes or secure a line of retreat. In Frayser's Farm a new Combat Results Table emphasizes playability while also simulating the lethality of the rifled musket. Leaders accelerate the action, replicating the importance of their presence during battle, and supply lines require players to protect their logistical trains. Winning a battle will depend on deployment, maneuver, and massing firepower, as well as the strengths and weaknesses of each particular army.